Our Spill range is really well designed with rolls that are specifically for oil spills to 50 litre spill kits. Oil Only Roll. The Oil Only roll is well suited to mechanical engineering workshops. It is perforate..
PW Spill 120 Litre Maintenance Kit. An economical kit packed in a yellow 2-wheeled industrial streng..
PW Spill 120 Litre Oil Only Kit. Similar to the maintenance kit but contains extra strong oil pads a..
PW Spill 20 Litre Maintenance Kit. An economical spill response kit that is easy to carry and small ..
PW Spill 20 Litre Oil Only Kit. 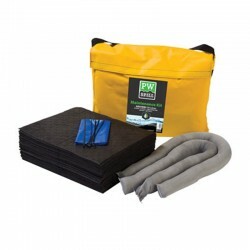 The kit has extra strong oil pads and socks that absorb oil and repe..
PW Spill 50 Litre Maintenance Kit. Waterproof holdall allows the kit to be stored outside and is yel..
PW Spill 50 Litre Oil Only Kit. Similar to the maintenance kit but has extra strong oil pads and soc..
PW Spill Maintenance Pad. These pads have open edges for quick wicking. High strength spun bond cove..
PW Spill Maintenance Roll. The maintenance roll is a workshop favourite easily dispensed and ideal f..
PW Spill Maintenance Sock. The maintenance sock has a knitted outer skin with fast absorbency speeds..
PW Spill Oil Only Pad. These pads are hydrophobic which allows them to float on water and have be..
PW Spill Oil Only Sock. Our oil only sock has a spun bond outer for durability. The sock is hydr..